When a small group of fellow blues enthusiasts emerged at school, there was a real buzz. The violinists and cellists became instant witnesses to Muddy Waters, Elmore James, Lightnin’ Hopkins, Chuck Berry or Bo Diddley. The pianists meanwhile worshipped at the alter of Pinetop Perkins, Jerry Lee Lewis or Professor Longhair. Nobody knew much about Willie Dixon, Fred Below, Willie ‘Big Eyes’ Smith or any other rhythm section players, so our solitary percussionist just got on with it. All of which left a big gap in the market. A gap I meant to fill. Short of approximating the theme tune to the Old Grey Whistle Test, nobody could really figure out the blues harp, although we accepted this was essential for completing our burgeoning blues band. 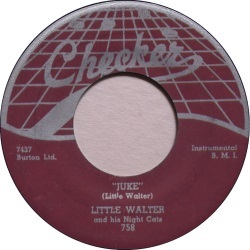 And everyone agreed Little Walter was where it was at. Everyone that is, except me. I nodded in tacit agreement. I couldn’t risk excommunication from our musical conclave. But somehow Big Walter seemed to speak more clearly. Through the harp at least. As did Sonny Boy Williamson II and Jimmy Reed. Inwardly I knew I was a ‘Walter Minor’ apostate. Big Walter was the daddy. Sure, I knew all about My Babe, Out Go The Lights, Temperature and Just Your Fool. My favourite Brit Blues and Pub Rock bands were covering them. Lew Lewis Reformer, Dr Feelgood, The Blues Band, 9 Below Zero and Fast Eddie, they were all at it. But I was contrary by nature. Not a counter-revolutionary, just someone who ran apart from the pack. Now, wholly and retrospectively, it’s time to change my ways. I’ve decided to grasp the nettle and do penance. It’s time to find my inner Walter. I have no idea how or where my odyssey will end, but during this quest for the holy wail, I will keep a diary to record my progress. 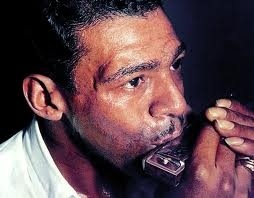 Will I determine once and for all whether all the soothsaying that surrounds Little Walter is just pentatonic hot air? Will I find my way to short-harp nirvana before I scuttle back into the blues closet, Big Walter LPs tucked under my arm, and lock the door behind me. Time to find out. Great bit about Little Walter. I think like tons of harp players you can fall into one,both or many camps of influence and I have spoke to heaps of harp players on many levels who just don’t dig Little Walter but of course appreciate who and what he is! No shame in what you have to say in fact it’s honest….go forth and bloweth as some cat once said …I’m sure ;-). I totally hear you about the timing issue on the “Juke” recording! I’m a latecomer to this particular party, but loving the site! Thank you for an interesting and diverse coverage of the subject. A thought tho – as someone else noted, a lot of the guitarists used to only keep rough time (took me ages to work out Muddy Waters had played a 17-bar blues on one track! ), so maybe Little Wal simply missed a note or whatever and that’s the version we hear? Any other recordings of it by him to compare and contrast? Yours in total enjoyment and considering using another harp! Adam you’re very kind. Glad you’re enjoying our humble offerings! The second verse actually throws some 2/4 bars in there (2 of them). However, you can simply add to counts and do a (2 2″ 1) riff to close out the two extra beats and then it becomes a standard 12-bar format your band can support you on without getting crossed up. That’s a handy top tip Greg, thank you for sharing. ”Walter Minor”! Have mercy, even with an ax (instrument sounds ridiculous applied to this glorified pitch pipe tempered such that it isn’t even of use for tuning!) renown for attracting obsessives (I’ll spare ya’ll the graphic, Freudian appellation!) I confess to having taken obsession to another level. Man, as a carefree teenager I had the time and energy to worship my harp Gods beyond merely endlessly copying their licks and phrases to even regularly PRACTICING their actual (and audible) breathing patterns, without even have a harp in hand. I’d walk around doing glottal pops, exercising my diaphragm, and making John Mayall ”noises”. I read books on, and practiced, ”Lucid Dreaming” techniques so that I could talk to Rice Miller and John Lee Williamson. That was eons ago. Then followed the long middle years where one is steady gigging as a professional entertainer and constantly immersed in all aspects of the music, but also caught up in all of real life’s irksome demands, and the ”absorption” of the music takes place in a different way and from another, more oblique, angle. In retrospect, a ”study” no less deep, but just, necessarily, less deliberate. But it’s all recombining, congealing, and being filtered through each unique, existential experience. Then comes semiretirement from civil involvement (it’s too depressing these days anyway!) and from being a householder. Suddenly one has time (maybe the last time!) to revisit all the accumulated books , notebooks, and really get back into the regimented study of the music (which is so rich that it easily and fruitfully bears this re examination). I’m not so old as to be ready for the dreaded ”second childhood”, but I’m definitely enjoying my second adolescence! And now there is this incredible internet with resources like this site and the virtual communities of (almost) equally obsessed brothers and sisters. But, sir, I have never encountered such a bracing, head clearing, refocusing act of iconoclasm as is your pronouncing Marion Walter Jacobs, ”Walter Minor”. If you were a distiller or more likely (around my area!) making shine, I’d have to compare reading your ”Little Walter Diaries” and that one phrase ”Walter Minor” to the best slug of bust skull whiskey I ever survived. Like we used to say in the 80’s (in quite another context) ”Whooo! Good line, man!